University Study in Year 12 ?? Years 11 and 12 female students interested in Aviation careers are encouraged to participate in the Air Force Simulator Experience Day on April 10 and 11. Students will have the opportunity to have a go on RAAF Simulators, as well as meet current serving female Pilots, Air Traffic Controllers, Mission Control Officers and Air Crew. If you'd like to see what a career in flight might involve, email wid@drf.com.au or contact Ms Cummins for more details. Students in Years 10 and 11 in 2019 are the first to study under the new Queensland Certificate of Education (QCE) system. myQCE will help you plan your pathway to achieving a QCE by the end of Year 12 and explore further study, training and career options.Click here to go to the new website explaining the new QCE. UMAT is NO LONGER needed for entry into Medicine or Dentistry at certain universities across Australia and New Zealand. It has been replaced by the University Clinical Aptitude Test (UCAT). Not all universities require you to sit and pass the UCAT so it is best to check each universities’ application/prerequisite requirements. Registration and test bookings for UCAT opens on 1 March 2019 and closes on 17 May 2019. The official UCAT website is at https://www.ucatofficial.com/ucat-anz/practice-tests/ For more information, visit CHAC Careers Office. This industry qualification is designed for students with a special interest in the sheet metal industry. 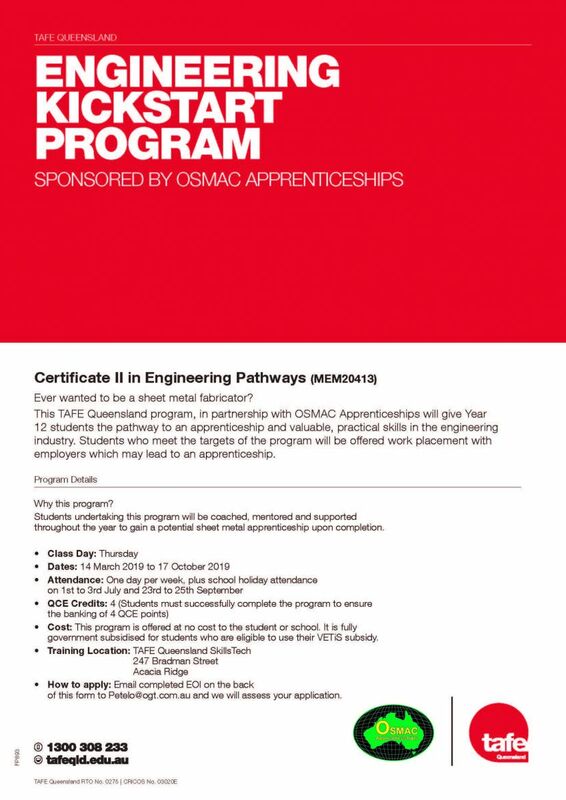 TAFE is working with OSMAC Apprenticeships to assist students in gaining a potential sheet metal apprenticeship upon completion. The latest edition of the Options Newsletter is packed with information from gap year programs to news from Queensland's key universities. Read it here. Copyright © 2019 Cannon Hill Anglican College Careers. All rights reserved.